The Coral Triangle is a marine area found between the Pacific and Indian oceans that is 647 million hectares of land and sea. It is located within the territories of Indonesia, Malaysia, the Philippines, Papua New Guinea, Solomon Islands and Timor-Leste. It is so named for the triangular area of the tropical marine waters of those countries. This area is both unique and important because it contains more marine species than anywhere else on the planet. It is home to 76% of the world’s known coral species. It has the highest reef fish diversity with 37% of the world’s reef fish species. It also provides habitat for six of the world’s seven species of marine turtles. Endangered fish and cetaceans such as tuna and blue whales also live and reproduce here. Whales, dolphins, porpoises and whale sharks feed, breed and migrate in these waters. There are an estimated 120 million people living in coastal communities who are directly dependent on the Coral Triangle’s resources for their food, income and protection from storms. According to the Coral Triangle Knowledge Network, about $3 billion in fisheries exports and another $3 billion in coastal tourism revenues are derived in the region. This rich habitat is under threat from over fishing, destructive fishing methods, land development, pollution, poaching and climate change. The over fishing and destructive fishing methods are depleting fish stocks to levels that may be unable to recover. Climate change affects coastal ecosystems in the Coral Triangle through warming, rising seas and ocean acidification. Widespread coral reef bleaching, sea level rise and seawater acidification endanger marine animals like reef fish and marine turtles. Reef building corals cannot survive if the water keeps warming. The Coral Triangle is receiving help from the region’s governments and nature conservation organizations as well as donor agencies such as the Asian Development Bank, the Global Environment Facility and USAID. 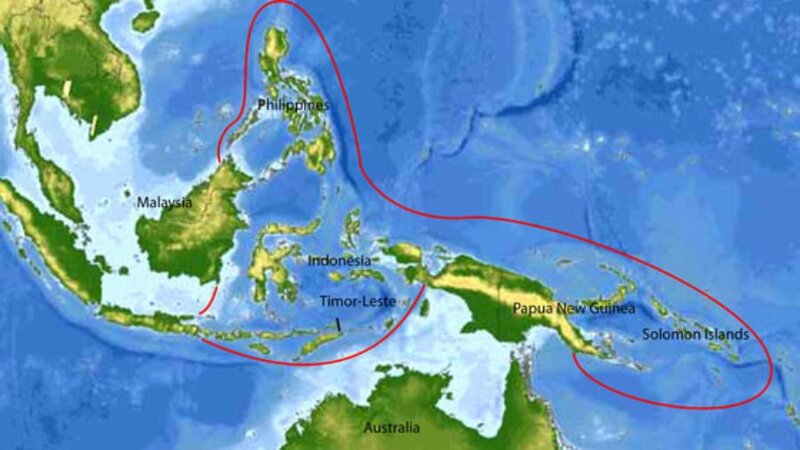 The Coral Triangle Initiative on Coral Reefs, Fisheries and Food Security, is a partnership of the six countries in the Triangle formed in 2007 to address the threats. The actions taken by these organizations include creating marine protected areas to protect coral reefs and sea grass beds from destructive fishing practices thus allowing the damaged areas to recover. It also allows fish to reproduce and grow to their adult size while providing refuge for other marine species such as endangered marine turtles. Mangrove trees and shrubs are being planted in coastal areas to protect the shoreline from storm surges and erosion. There is still much to do to protect this very special area.